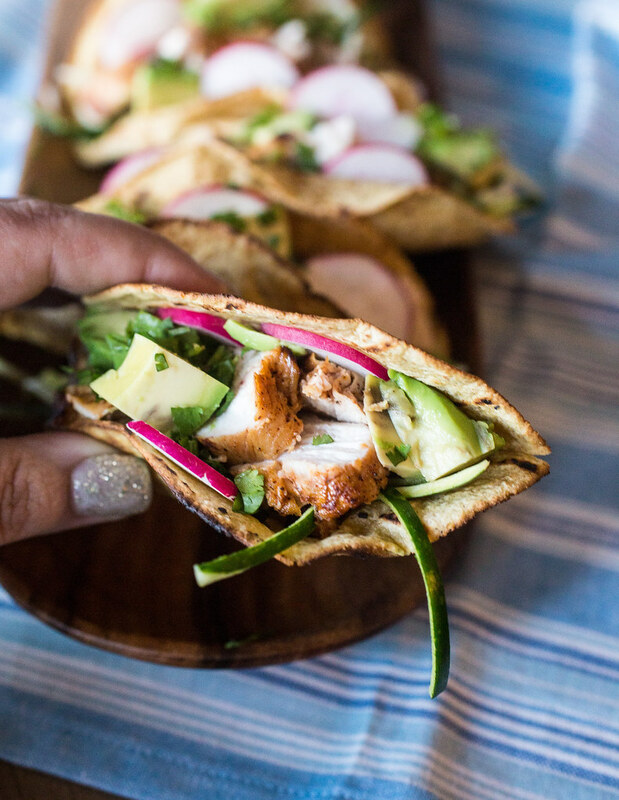 Tequila lime chicken tacos with zucchini slaw – or, your new best taco friend! With a salt-rimmed margarita in hand, Taco Tuesday can’t get here fast enough. I’ll be the first to admit that I don’t drink alcohol all that much. It’s not for any particular reason other than the fact that lots of different types of booze, wine, and beer make me SO hot. Like OMG-I’m-having-a-hotflash HOT. It’s no fun at all. And I know this because my instigator cousin – the one who is now old enough to legally drink and by this fact alone makes me feel completely old – convinced me to go halfsies on a bottle of tequila when she was here to visit a couple of weeks ago. On a weeknight. 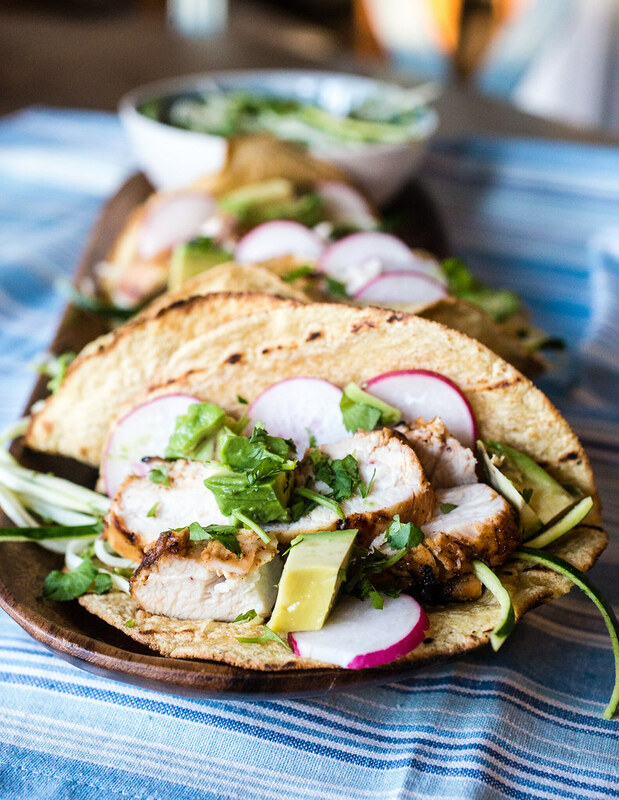 We munched on chips and guac and made lots of these tequila lime chicken tacos with zucchini slaw. We also made lots of margaritas. Thank goodness we both had the next day off from work because those margaritas just went down so smoothly. Too smoothly. I won’t say more than that but I will say that I definitely did not wake up with a hangover the next day morning. So good tequila it is from here on out! And more of these tacos too! In fact, Kyle and I made them again last night for Taco Tuesday and they were just as incredible while sober as they were after a few margaritas. Who knew? Actually, I knew they would be since I’ve been making this tequila lime chicken recipe for yeeeears and it’s always amazing. Why I never thought to make tacos with the chicken, I have no idea but…HELLO lover! 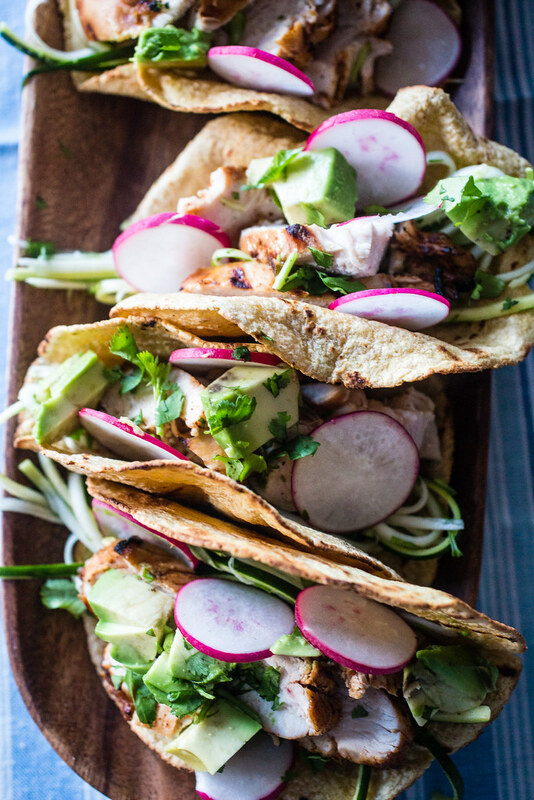 Say it with me: tequila lime chicken tacos with zucchini slaw. 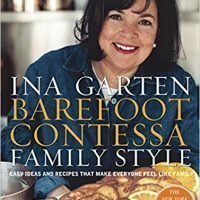 The chicken is marinated in a triple-citrus, garlic, and chili marinade for a day and then it’s grilled. The marinade is so easy to make that Kyle whipped it up for me yesterday while I was at work. Needless to say, he’s now a big fan of our vintage juicer. P.S. about that juicer: That’s the one that Ina uses in her kitchen and I didn’t realize my mom had the same one until a couple of years ago. You wouldn’t believe how quickly I snagged hers when she said she never uses it! 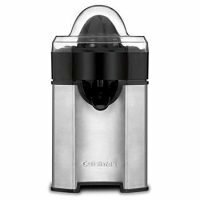 If you’re in the market for a juicer, this is Cuisinart’s newer and very popular model of that vintage one! 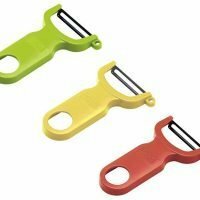 The zucchini slaw comes together in a snap, especially if you have a julienne peeler or a spiralizer. Make use of those lesser used kitchen tools for this recipe! The zucchini gets tossed with half of a jalapeño, lime juice, a little salt, and good handful of cilantro. It’s almost like you’re making guacamole with these ingredients! And let me tell you, you’ll never go back to plain ol’ shredded lettuce on tacos after you’ve tried this zucchini slaw! 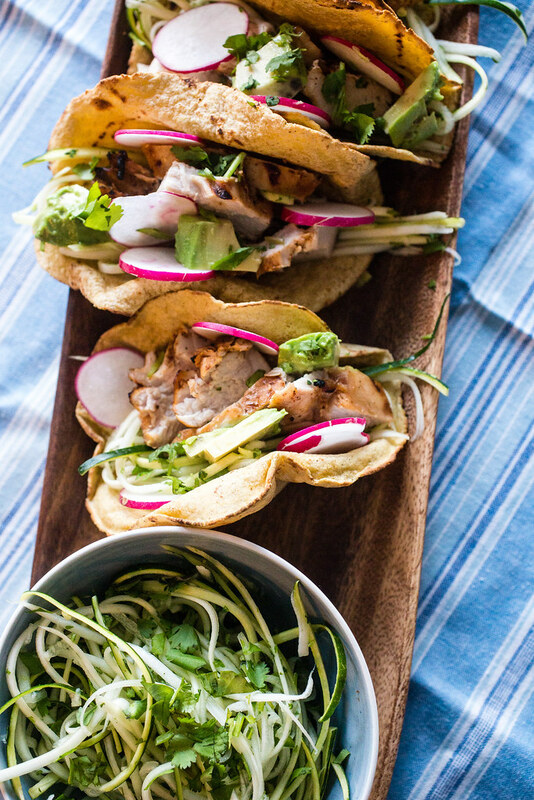 The pop of fresh, crunchy, limey flavor this slaw adds to the tacos is unbeatable. 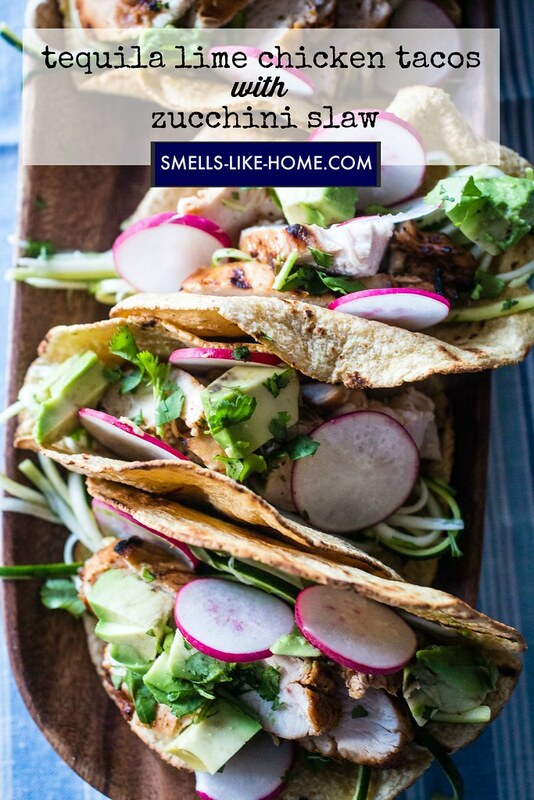 Topped with some avocado, sliced radish, and a sprinkle of cilantro, these tequila lime chicken tacos have now just jumped to the top of my favorite tacos list, which is really sayin’ somethin’. Combine all of the ingredients through the black pepper in a large zip-top bag. Close the bag and shake to mix well. Add the chicken. Refrigerate for 4 to 8 hours. 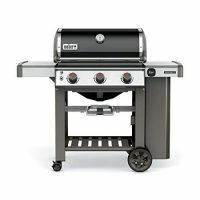 Heat the grill to medium-high. Grill the chicken for 3 to 5 minutes per side until the internal temperature reaches 165° F. Allow the chicken to rest for 5 minutes before slicing. 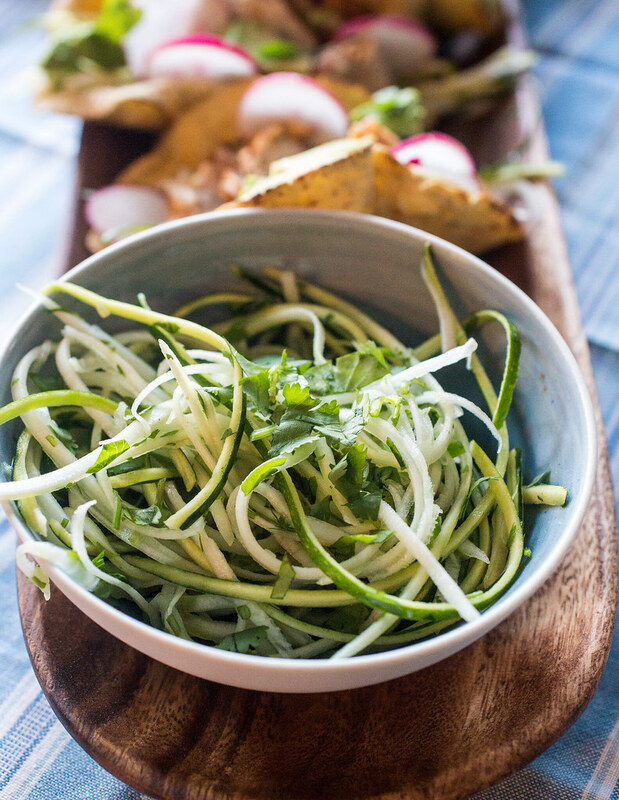 While the grill heats, mix the zucchini slaw ingredients together in a medium bowl, adding salt to taste. 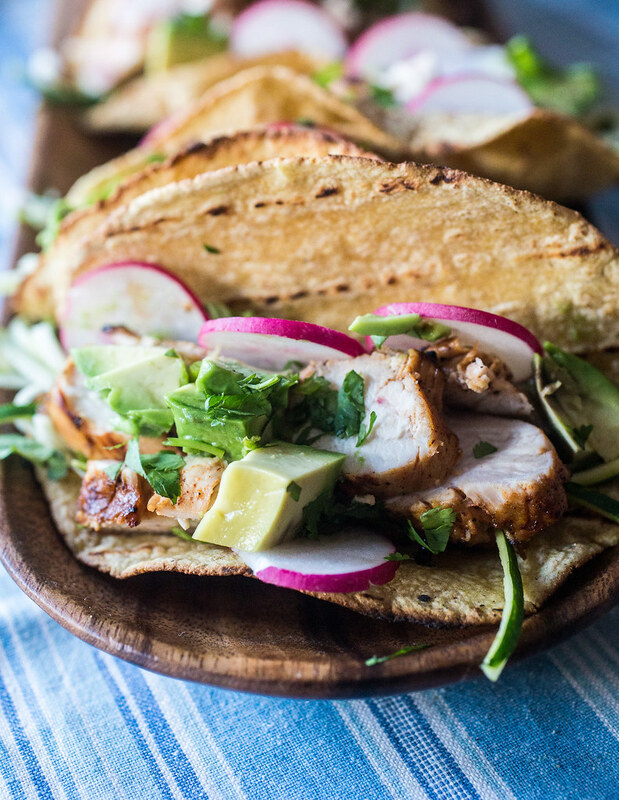 Add some zucchini slaw to the tortillas and top with chicken, radish, avocado, and cilantro. Serve while still hot. If desired, you can toss the tortillas on the grill for 1 to 2 minutes per side to char a little and heat up. Keep the warmed tortillas stacked in a kitchen towel to prevent them from drying out and turning hard before assembling the tacos.